InVogueJewelry: Prasiolite: A Natural Gemstone? Or Heated Amethyst? Prasiolite: A Natural Gemstone? Or Heated Amethyst? A few months ago, someone sent me an email regarding a Prasiolite necklace I had in my shop. It was brief: "Is this natural Prasiolite, or heated Amethyst?" And before I could answer, she wrote back: "Never mind. I read your description." And then I never heard from her again. A classic case of the old Asimov question----did she want the answer that's true, or the one that satisfies? Most people don't want the truth, which is strange! I would have told her that there is NO "natural" Prasiolite available in the marketplace. But she didn't want to hear that---she wanted to believe some sellers who claim to offer "natural, untreated Brazilian Prasiolite." And that is definitely NOT the truth! 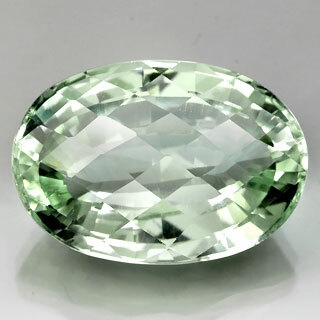 Prasiolite is the name of the gemstone that is transparent celadon-green quartz. Amethyst is transparent purple quartz. Citrine is transparent yellow quartz. Is it the same as Green Amethyst? Yes. 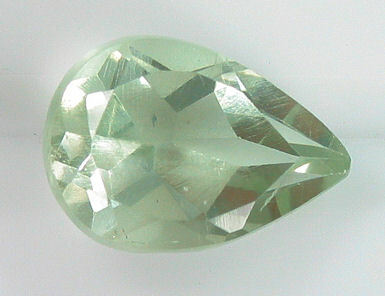 Prasiolite is often referred to as "Green Amethyst". It's also called Vermarine, Lime Citrine, and just Green Quartz. Although there has been a VERY small amount of natural Prasiolite found in nature, ALL of the prasiolite that you see commercially is treated Amethyst, or perhaps treated Citrine. In fact, I read that the Smithsonian Institution has a very small piece of a fractured crystal of Prasiolite green quartz dated from 1884. But I couldn't find a picture of it, or any information about it, on the Smithsonian website. And a rare gems specialist, K and K International of Virginia, has some small .40-ct. faceted natural green Prasiolite gems which they've had in their collection for years. So virtually all the Prasiolite you can find in jewelry is treated Amethyst (or Citrine) from Brazil. It's interesting to note that there is NO WAY to determine if a Prasiolite specimen is naturally heated or heat-treated. Also, the color can fade over time, and with exposure to sunlight. Prasiolite occurs when amethyst or citrine undergoes a heat treatment while in the presence of iron, transforming the quartz into a beautiful pale celadon green. This heating mimics how nature produces this gem. Even though quartz is, by nature, relatively inclusion-free, exceptionally clean crystal rough is selected for this heating process. This clean rough assures even color distribution. Most prasiolite comes from the Montezuma mines at Minas Gerais, Brazil. Colors can range from the very palest of green to a deeper more intense celery green. Only 30% of quartz undergoing this treatment transforms into the cool green color. Without proper identification, some of it might be mistaken for green beryl or a light-toned green tourmaline! Recently, some Prasiolite has been formed by heating Smoky quartz. The result is a darker, dusky green color. 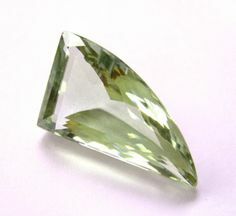 Prasiolite is often cut into large carats with complex, intricate or unusual cuts to bring out the color of the stone. 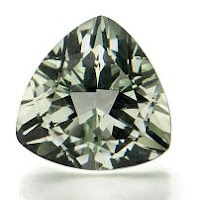 Concave cuts, checkerboard cuts, triangular cuts, and microfaceted briolettes are often seen. Prasiolite is a great gemstone for gem collectors looking for distinct and attractive green color, availability in large carats, eye cleanliness and affordability. I would like to just reiterate that ALL of the prasiolite found in the marketplace is heat-treated amethyst or citrine. There is VERY LITTLE of the natural green quartz, and that would be found in very old jewelry or in old mineral collections. Also, I want to add that sellers who offer "created" quartz----maybe called "not natural", or "lab grown" or "hydro quartz"---they're really offering colored glass. FYI, just a few years ago, so-called "Hydro Quartz" was sold as "hydro quartz glass" usually from China or India. Somehow, the word "glass" has dropped off and people are claiming this glass to be a gemstone. I've written other posts about this, including pictures of huge slabs of this colored glass rough for sale in China and Thailand. And it's clearly being sold as "fused glass" or "hydro quartz glass". HERE is a website that sells this glass. And HERE they're offering "fused silica--jeweler's silica" which is glass being sold specifically as gem simulants. Again, I've taken MANY samples of hydro quartz----now over 50 different samples----to be examined by a gemologist, who looks for crystal structures within the stone. If there is no crystal structure, it's glass. There are other tests as well. And NONE of the samples I've ever seen were anything other than glass. Quartz is the second most abundant mineral on earth (second to feldspar). It naturally grows in HUGE clear and beautiful crystals---amethyst (purple quartz) is the most expensive quartz. SOMETIMES labs will grow Amethyst in a lab, which results in a very dark amethyst with bright red flash ("Siberian" is the color). That is because that deep Siberian purple/red color is cost-effective to grow and then sell. Also, dying clear quartz purple will result in a quickly-fading color (and so purple "doublets" can be found---utilizing a purple bonding agent between two clear quartz slices). Clear quartz is grown in labs, but mostly for the electronics industry and other commercial industries. Hydrothermal process gems are definitely grown---expensive synthetic gems such as corundum (sapphires and rubies) and emeralds. Synthetic gemstones are lab-grown but possess the same physical, chemical and optical properties as their natural counterpart. So a synthetic sapphire IS a sapphire. Tourmaline, FYI, is still not successfully lab-grown so only natural tourmaline is available. So when you see such things as "ruby quartz" or "paraiba quartz" or "tanzanite quartz" or "emerald quartz" or "rubellite quartz" --- stones with vibrant colors and names of actual gemstones to describe the product---those are hydro quartz, which were always known as hydro quartz glass. I have seen "prasiolite hydro quartz" for sale and now THAT can't even be possible! Reputable gemstone wholesalers, who sell gems to jewelers (such as Rio Grande Jewelry) do not sell "hydro quartz" at all. They only deal with actual gemstones. If you can't find something listed on the GIA.edu website, or the ICGA (gemstone.org) then you should question the validity of a "gemstone" offered. Or send them an email---a certified gemologist will get back to you and would be glad to answer your question! Now, I don't know about you, but on MY monitor, those are blue. They're like the color of Windex. And the color isn't really saturated and....well, as you can see, these are NOT prasiolite, and I'm very sure they are glass. Perhaps some wholesale seller told her they are "natural"! But there's NO EXCUSE for something like this, something this fraudulent. Any jewelry seller needs to take responsibility and find out what they're offering! The description further states that these "Green Amethyst" earrings are "UNTREATED"!!! Well even if they were actual Prasiolite, they would absolutely BE treated---that's how prasioliate is made!! Heat treating purple quartz!!! 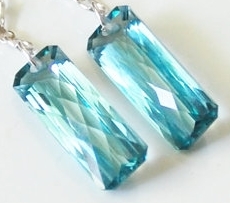 Those are obviously glass and they look more like those Swarovski "column" crystals than they do any quartz. Norma, why not purchase a prasiolite ring? It's a treated gemstone, like many, MANY other gemstones....such as blue topaz, citrine, even precious gems like rubies and emeralds, and really there are too many to list here. It's a natural quartz gem, not man-made or grown in a lab like literally tons of deep purple Amethyst stones that arrive in the U.S. each year (lab-grown). Just like citrine, the treatments to these prasiolite gems are accepted within the jewelry industry. So if you like the pale-green color of this stone (although it can fade in sunlight) then please don't be discouraged! It's a genuine gemstone, and a very pretty pale celadon color! Jewelry is something fun to wear and enjoyable to look at! Thanks for reading my blog, Norma! Hello! Thank you so much for asking about the ring! First, I have to say that the ring is truly beautiful--I love the style! It's an expensive ring, but there are lots of factors in pricing jewelry...the materials (18k Gold, round brilliant diamonds, the center Prasiolite stone itself), as well as gem cutting and the designer's time and all the gem setters' time, etc. Plus, there's the overhad (the cost of a shop's rent and employees). So here are lots of factors regarding the pricing of a piece of jewelry! Prasiolite is quartz, as you know, which is a semi-precious stone. It's a large gemstone in an unusual cushion cut (and a very deep stone). That adds to the value as well. One word of caution regarding Pradiolite---it really does fade over time. I have a prasiolite necklace that I really love, but the color has changed from a deeper green to a more pale celery green. I like it, but it did fade---and I don't wear it that often. The value of Pradiolite, like any gemstone, rises and falls with its popularity. Prasiolite is a popular gem right now and therefore the market value has gone up. So, remember that when you buy jewelry from a major jewelry store, or from a shop in an expensive area, everything will be priced higher. And the addition of pave-set diamonds also adds a lot to the price. You could find a beautiful Prasiolite solitaire (or with a few accent stones on the shoulders of the ring) and spend a fraction of that price. So, yes there's value in Prasiolite, and added value in the diamonds and 18k gold surrounding the gemstone in that ring. And there are so many factors in jewelry pricing, and a major one is the jeweler's overhead. So if you were to find an independent designer, even online (like on Etsy or somewhere like that), you could work with that jeweler to design a Prasiolite ring that fits your style and at a price that seems more reasonable. I always say that if a piece of jewelry makes you happy, then THAT is where the value lies! I hope this helps! And thanks so much for asking! Thanks for the information! I have a prasiolite ring I love and I will take better care of it since I have learned about the fading. I recently purchased a trillion prasalite ring with green diamonds on shank & green diamonds surrounding the trillionth shaped stone. 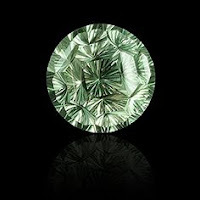 It is a large stone, with .2 5 green diamonds. Set in Dover. I paid &102 with tax & shipping. With this description do you think I paid a fair price. Now the fading... Does that occur no matter what or just heat, sunlight? This color is now a darker celery green. Could it turn clear, like to white? Are you saying don't wear on sunny 70-100 degree days? Hello! Your ring sounds really beautiful, with a fancy cut (trillion) prasiolite plus green diamonds! And that is a great price! I'm sure you love your ring and receive a lot of compliments on it! Your prasiolite won't turn clear, but it might fade a little if it's exposed to a lot of sunlight. I live in the desert at a high altitude so my jewelry gets a lot of sun and my prasiolite did fade to a very light green color. However, it wasn't that dark to begin with! So yours won't turn clear, but it might fade a shade or so if you wear it in bright sunlight often. It could be that mine was very inexpensive (and I mean VERY--I paid something like $10 for the gem itself!) and was a light celery green color and gradually faded (it wasn't sudden). Yours is certainly a MUCH higher quality prasiolite gem, and a richer color, so I think you'll be fine wearing yours outside! Thank you this is very informative. I just bought a gorgeous ten carat prasiolite ring, and somewhere I read that you shouldn't call it green amethyst. But your article confirms that it's really what it is! So since I can't remember the word, because actually I had never heard of this gem before I saw and fell in love with my ring, I'll just call it my green amethyst! Thanks so much for your comment! I LOVE this gemstone and I'll bet your ring is just gorgeous! I call it "green amethyst" myself---that's what everyone knows it as, and gemologists actually call it "greened amethyst" which sounds silly to me! Have fun wearing your beautiful green amethyst and I'm sure you'll get lots of compliments on it (I do when I wear mine)!